To request rates and availability for any of the recommended hotels, or any other that may not appear in the list, please send us an e-mail at info@aventurawine.com. We have special rates to offer. 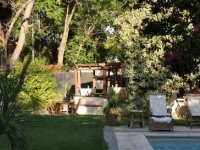 Located in a residencial area, between two of the most traditional streets of Mendoza (Belgrano and Sarmiento), a few blocks away from the main comercial and touristic spots. 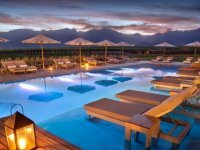 Elegant five - star hotel, with its beautifully restored 19th-century Spanish colonial façade, is one of the most prestigious luxury hotels of Mendoza. 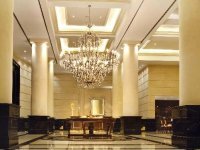 The Park Hyatt Mendoza is strategicly located in the main financial district of the centre of Mendoza city. It has rooms with inside views to the internal patio or to the Andes Mountains. It includes Deluxe services such as king size beds with down pillows and down comforters, marble bathroom with independent shower and a working are. 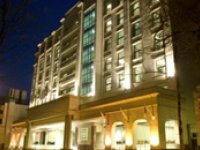 The Sheraton Mendoza is located at the heart of the city of Mendoza, with an ideal location to explore one of the most populars touristic cities of Argentina. 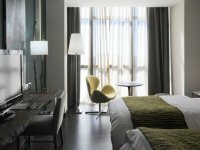 It has 180 comfort and classic rooms. Each of them with an amazing view to the mountains or to the city. The also have all the comfort of your home, including the Sweet Sleeper Bed. 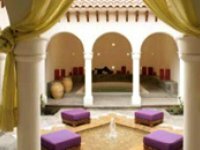 It has a big and romantic Lobby Bar and a cellar. On the 17th floor is located the Mirador restaurant, the highest of the city. Its contemporary architecture, defines the traditional, simple style of most buildings in the area. 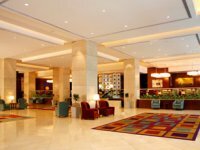 Located next to the city’s largest shopping mall and casino, the hotel boasts West Argentina’s largest meeting space and world-class accommodations. 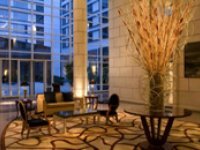 InterContinental Mendoza is conveniently located 20 minutes (13km) from Mendoza International Airport and 5 minutes from downtown. 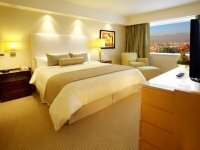 Esplendor Mendoza offers 118 rooms: Concept rooms, Suites and VIP Suites with panoramic view to the Andes mountain range or to the city of Maipú. All of them are equipped with indispensable amenities for pleasure or business trips: Wi-Fi Internet connection, 32-inch TV, soundproof windows and many other services. Esplendor Hotel Mendoza is conceived bearing a style in which design and entertainment prevail. 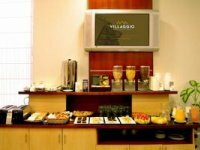 The Hotel and the Arena Maipú Complex offer a wide variety of activities and services to enjoy a relaxing and fun stay. 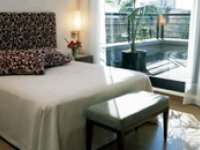 The Modern is located in the city center of Mendoza, just 4 blocks away from tha main Avenue, surrounded by important touristic spots, premises and banks, available for your stay, wheather it is for business or for pleasuere. It has new quality installations to receive families or corporative guests. This elegant 4 stars hotel was open in March 2009. 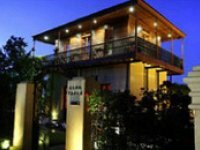 It has a distinguished and warm styel that will allow you to enjoy a comfortable and pleasant stay. The traditional Huentala Hotel was opened in 1976, and it has become an icon in Mendozaís hotel industry. 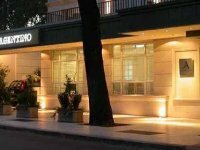 It is located in a privileged position right in the heart of the downtown, very close to the main avenue of the city and a few blocks away from the central post office, the banking and the commercial area. Its name pays homage to the first inhabitants of our land ( the tribe Huarpe Milcayac), from which Huentala or Huentata ( guanaco valley) derives from. 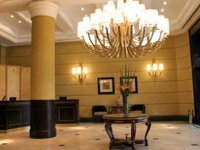 Legendary and traditional, the Argentino Hotel retains the reasons why it became the small hotel chosen by all visitors to Mendoza. Its primary mission, passenger service, turns your stay in comfort and optimizes your available time. 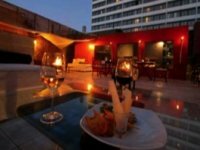 With its elegant and contemporary design, the Bohemia Hotel Boutique is located in one of the most elegants neighbourhoods of Mendoza, where the business and tourism gather, with an important view to the Andes. It is surroudend by the San Martin Park, the best restaurants, bars and pubs, which are located just two blocks away from Bohemia. The elegant and atractive center of the city is just 10 minutes away walking from the hotel. Club Tapiz is located in an estate built in 1890 and surrounded by 10 hectares of vineyards. The house was restored preserving its Renaissance-style villa structure and maintaining vintage elements, such as the patio and pinewood floors, the connection with its surroundings and enthralling views of the Andean Range. A few meters away from the house there is an old winery that produces artisan wines. Club Tapiz welcomes guests traveling on business or for pleasure. 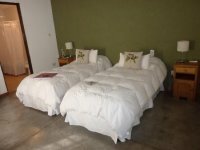 Lares de Chacras has comfortable rooms for our guests to enjoy and feel at home. It is the best part of the house that combines country style and the services the guests need. All rooms are decorated with tasteful details and are flexible in a way that they can be prepared as single, double, triple and even quadruple rooms. At Casa de Uco Vineyard & Wine Resort we invite our guests to live and breath wine culture, in an unbeatable setting at the foothills of the Andes Mountains. 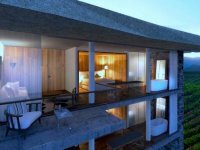 The essence of the hotel, an impressive structure inspired by the geography of the land and its natural surroundings, strives to provide the utmost level of comfort, while still unifying with the mountains, vineyards, and clear blue skies. 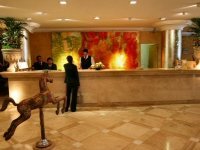 Inside the hotel, our accessible staff reinterprets traditional hospitality codes with an updated philosophy providing an extremely personalized and friendly service. Alpasión lodge is an ideal place for unforgettable experiences. 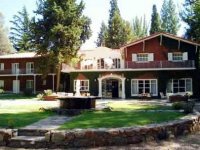 The lodge is located in Uco Valley, just an hour and a half away from the city of Mendoza. 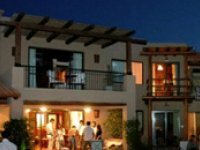 Alpasion Lodge, has 5 luxurious double guest rooms with private terrace, cable TV and Wi-FI internet. Each room has a unique style based on one of the elements: metal, wood, earth, air, water, fire. Our facilities include a Wine Cellar, to taste an excellent variety of wines from the region, a large dining room, cozy living room to unwind and a library with a fireplace where you can enjoy reading our collection of books. 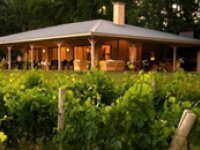 15 uniquely luxurious, spacious rooms and one exclusive loft above the vineyard. Each room features subtly luxurious design and impeccable levels of comfort. 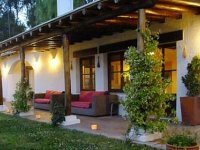 At Casa La Galeana we offer a space of relax and comfort, where nature, art and an excellent gastronomy are the ideal frame to taste a great Malbec with friends, set up work meetings or simply enjoy your stay in Mendoza, whether it’s for tourism or business purposes. Well be looking forward to you visit, for you to live an unforgettable experience, that you will want to repeat. In the heart of the farm is located our home: the Mansion, built in 1900. Preserved in its original structure and recycled in order to keep it in time, has the same purpose as it had in his creation: accommodate those who want to have the experience of enjoying, relaxing and learning the origins of the genuine work of true country people from Mendoza. The Mansión has a huge gallery with natural light, bathed by the morning sun that appears full of perfumes and aromas of Merlot and Malbec vines that surround the place.